Music is my lifetime companion. It is always in me. When I was 5 years old, I was taken along by my family to watch a Hindi movie “Bhabhi”. I was, like many, a playful child, unmindful of what was going on in the movie. All of a sudden, I hear a voice in the movie “Chal Udja Re Panchi”. I was floored and was literally consumed by this voice. I was then told that it was the voice of Mohammad Rafi Saab! In my sub-conscious mind, I sensed something divine in this voice and since then I became a life-time fan of Rafi Saab’s songs, his expressive renditions and voice. I started practicing his songs and today, I perform across India and the world at large! It is an unshakable fact and truth that Rafi Saab had “Aathma” in his voice, as was claimed by the popular and accomplished music composer’s duo Shankar Jaikishan. Coming from humble beginnings and an orthodox family, I went on to become a Chartered Accountant as well as a Cost Accountant and served many multinational companies, both in India and abroad. During 1990’s, I introspected and then decided to pursue my singing passion into profession by performing on stage, specializing in retro evergreen, timeless Bollywood songs from the golden era! To me, music, in any language or form is divine. It is sheer health and welcome diversion from the routine and speed of life. For me, it is also meditation. I sing for more than 4 to 5 hours for programs and I never get tired or exhausted. On the contrary, I get energised after every song I render! The power of music can never be explained but can only be experienced! Why I consider Mohd Rafi Saab, the greatest of the greatest playback singers of all times? Music has no language, caste, creed or religion. Many singers, music composers and lyricists have come and gone. Many of us have our own tastes and preferences especially with singers and very rightly so. Like every one of you, I also have my taste and preference to a singer and he is none other than Rafi Saab. “Saab” kyonke unko izzatse naam leneka dil karta hai! The singers of Bollywood, Kollywood and for that matter, even singers across the world have established their respective places in the hearts of many music lovers. They had their own unique inimitable style which gave them their name, fame and recognition. Any one imitating a singer never ever could climb the ladder of fame and success. History, if is any indication, reminds us of this fact. Every singer was good in his / her own way and we are fans of every such singer, for their uniqueness in style and rendition and we have our own singing idol that we praise and believe that he/she is the best. Therefore, it may be pertinent to mention here that it would be a futile exercise or a debate, if, for example, we were to compare the greatness of one singer to the other. I often come across people talking about “Who is a greater / better singer – Rafi Saab or Kishore da?” Such debates, I am sure all of you would agree, shall never ever see any logical end or conclusion, simply because we are only attempting to compare the “incomparable”, Putting it differently, we are not comparing “apple to apple” So, we are now converging to a logical question..What made Rafi Saab the greatest of the greatest singing legend? Let us please remind ourselves that, as said earlier, Rafi Saab is as much a great singer to me as Kishoreda for someone else, for example. But then, I can only speak for myself – about my singer idol Rafi Saab and his greatness and invaluable contributions to the Bollywood music section of the industry. What I am going to explain now is what I strongly believe in and is a matter of opinion, which may differ from any or many of you! There is something more to singing when it came to Rafi Saab..Was it just good voice, melody, feel, expression, modulation, range and all of that? Certainly not…..It was that unexplainable vocal cord that radiated invisible vibrations across humanity and the world at large. He had a distinct and clear advantage over other singers – language Urdu and his diction was flawless and poetic! Rafi Saab sang from his heart and when he rendered a song, it was as true as nature! Is that all? Probably because of the miraculous blend of all the singing qualities that he possessed with that humility and godliness that he conveyed and expressed silently and so naturally during his lifetime..! A man of few words, he was a great human being and a singer, which blended so very well that made him the greatest singing legend of all times… Was it his extremely deep and sterling qualities as a selfless human being that gave his voice that much more feel and truth in his renditions to stand any test of time? I would tend to believe so…! When we listen to his renditions, we feel that distinct and inseparable blend of voice, sincerity with so much devotion and focus that his songs became timeless melodies, without choice! His humility gave his voice that extra mileage.. The Late producer director Man Mohan Desai, said once that “Agar Hum Khuda Ki Awaaz Ko Sun Sakte Hai, to wo shayad Rafi Saab ki Awaaz Hota”. Pyarelalji (of Laxmikanth Pyarelal fame, the notable duo music composers) says that Rafi Saab was a “Farishta”. He resides in the mazab of every religion, when he sings (for e.g., Sukh Ke Sab Saathi”, “Man Tarpat”). I have been, in my own way, doing extensive research on Rafi Saab’s singing abilities on each of his songs. Many music directors and actors were elevated to their next levels of fame and recognition, by the sheer unique way of rendering a particular song or a ghazal, by Rafi Saab, with so much of value addition, probably way beyond the expectation of the music composers. I often keep wondering if anyone ever could sing like him. I closely listen to each of his renditions very many times, everyday, to try and understand his extreme perfection with respect to literally all the parameters of playback singing which any singer, be it upcoming or established singer, would dream for! His mastery over voice stability, range, nose-diving ability to sing from the highest of the highest octaves to the lowest note at the blink of an eye, expression, feel, modulation, sweetness, power, emotion and what have you, cannot be explained but only felt..! I would like to term him as a “magic singing machine” when it came to his renditions. It is strongly believed that Rafi Saab died early because he sang, not only from his throat but his entire body, mind and soul were focused on his singing, in every possible way. He pained through every rendition, enjoying the pain, without bothering much about his health, as his love for music and singing was more than what he cared for, otherwise.. I can go on..! I breathe in and breathe out Rafi Saab’s renditions and I live with his songs.. That’s my daily routine. When someone tells me that I sing like Rafi, I get excited. Again when people advice me not to copy Rafi but to develop my own style, I say that I am happy to copy him to the best of my abilities as I worship him, beyond words. I also tell them that I would like to be like him, in every way!! 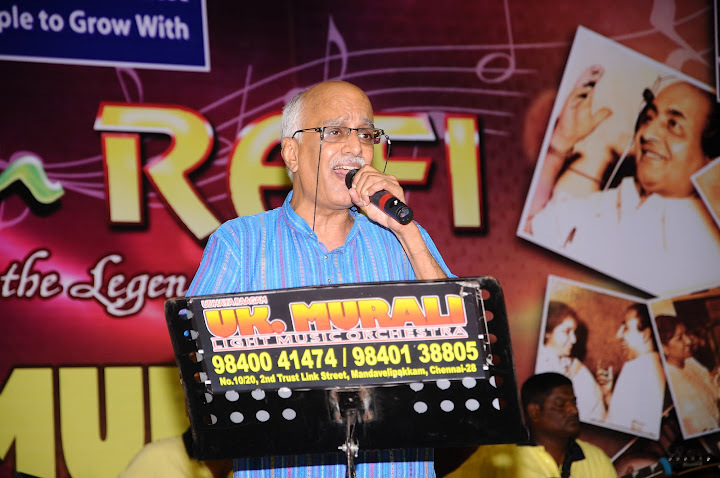 I co-founded the Rafi Saab Foundation, Chennai, an informal group of “Rafi Bhakts”, with the primary objective of promoting the many of his songs that have, so far, not been introduced/presented on stage. Rafi Saab claimed to have recorded some 28,000 songs in 11 Indian languages between 1944 and early 1980. All of us, with the exception of a few perhaps, would have hardly heard most of them. 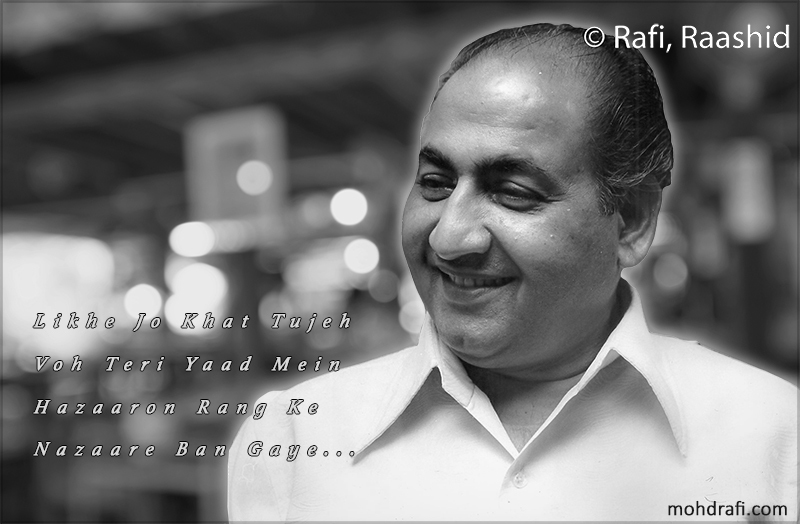 I salute this great singing legend called “Mohammad Rafi Saab”! This entry was posted on Sunday, December 24th, 2017 at 12:46 pm	and is filed under Meri Awaaz Suno. You can follow any responses to this entry through the RSS 2.0 feed. You can leave a response, or trackback from your own site. You are doing a great job Rajesh K Ranga keep it up, you have full support of all RAFI fans over the globe. I will continue to sign the petition as many times as possible for the greatest of all times, RAFI SAHAB. Jai RAFI SAHAB!! Proverb says ” Great men think alike ” I will replace it with ” Ardent Fans wish alike”,very very same here with me , our beloved Rafisaab is true integration of Dil Aur Deemag , with all human excellence and his devotion for the music , has bestowed upon us never ending journey of divine happiness . Thanks for article and for those who read and admire it . KSR, Great article. I wouldn’t have said it any better. Like you mentioned I can’t mention his name without “Saab” that comes naturally. Let me tell you, if you want you can prove his singing greatness by breaking up a song into many areas and marking them among all other singers and you could see what score Rafi Saab gets (Raj in one of the post mentioned this differently). I would be doing this one day. Anyway thanks for posting a great article about our farishta. Sir, what an article you have posted. It’s so wonderful. I feel exactly the same, bit by bit. By some coincidence I too was inspired by the song ‘Chal Udd Ja Re Panchhi’ from the film Bhabi when as a child I too was taken by my elders to watch the movie. The song just sat in my mind. As a growing child I would listen to numerous songs in the same voice and would think that some ‘Devta’ was singing. Later I learnt that these were sung by someone named Mohammad Rafi and I craved to listen to more and more of his songs. The craving has now turned into worship for this ‘God of singing’. I too sing Rafi Sahab’s songs with great passion and feel energetic and keen to sing more of his songs. I do not sing too much in forums but have posted songs on Youtube. Like you I consistently try to probe the X-factor that was there in Rafi Sahab’s singing. You put it extremely aptly by saying….’It was that unexplainable vocal cord that radiated invisible vibrations’…that made his singing invincible. I strongly believe that creation of Mohd. Rafi Sahab was a special act of God intended to amuse, enchant and entertain vast chunk of humanity in the sub-continent and beyond. I once again greet you for this wonderful article. Chandanji, Thank you for a very well-written article about Rafi Saab. You have exercised utmost care to ensure that you do not hurt the feelings of Music Lovers, and rightly so. You have touched upon his ability to sing with his entire body, rather than his throat alone. As an Engineer who has been entranced by Rafi Saab’s voice for about 50 years (I must have consciously started recognising songs and singers by age 5), my observation is that no singer ever used his entire throat for singing, except Rafi Saab. While every singer used a subset of the frequencies of their throat, Rafi Saab sang ‘full-throat’, whether for high octaves or low. He alone had the complete mastery of his entire range of frequencies and overtones, flawlessly adapting it to various genres – be it Indian Classical or a bit of Western, modern music. Whether romantic, philosophical, religious, patriotic, slow and sad, happy & fast, Ghazal, Naghma, comical – whatever, he used his entire voice! This is also the core reason for how and why he could sound different for different on-screen actors! I am sure everyone here knows of how he sand so differently for Shammi Kapoorji, Johnnie Walker, Rajendra Kumarji, Dilip Kumarji and other major actors of the day. So differently, that you could be pretty sure that X or Y is the person being picturised in a song by Rafi Saab, even if you have not seen the film or have not even heard of the film’s name! This is a quality that no singer has, and will ever have, in my humble opinion!! Talking of the ever-increasing number of fans of Rafi Saab, it was a pleasant surprise to find Twitter awash with the fond remembrances so many Rafi Fans, on 24th Dec – his 93rd Birthday! Google also paid due respects to Rafi Saab by featuring him on their Search Page, for the day! Isn’t that amazing? Just want to add one more fact: Rafi Saab’s song ‘Jan Pehchan Ho’, composed by Shankar Jaikishen for the film Gumnam (1965) was featured as the Title Music for the Hollywood film Ghost World, in 2001 – 36 years after Gumnam was released! And No, it is not some obscure Hollywood film, it has 18 year-old Scarlett Johansson, Steve Buscemi (both extremely well-known actors) and other lesser-known actors! And if you search YouTube for Jan Pehchan Ho, you will get more than 50 hits – of French, British, American and many others rendering the song in their own way, with a number of reviews and comments! Mind Boggling!! It is great surprise to me that a person from Tamil region, loves Rafi like anything. from you what attracts you from Rafi, though he has sung Hindi songs ? then, Tamilian accept Rafi Saab as unique singer in the Industry ? Great! I admire your single-mindedness and your down-to-earth attitude in recognizing and extolling the ultimate genius Mohammad Rafi. I know it is futile to debate who was greatest among the singers of those times but if someone can possess and demonstrate such a phenomenal range of qualities I think the argument will only disparage Rafi saheb’s stature and greatness. Kishore Kumar, Mukesh, Talat Mehmood, Manna Dey, and Hemant Kumar, and Mahendra Kapoor were all, undoubtedly, great singers, none could mesmerize the audience with such flair, clarity, variations, and intensity that Rafi Saheb managed to exude almost without fuss. I agree with your definition, description and devotion of Raffi Saab. But the argument which singer is the best is easily settled. Granted, I am a devoted Raffi bhakt. But the qualities you describe in Raffi saab’s singing, try to apply all these qualities in any other singer and other singers will be falling short, not in one or two qualities but many. I admire and enjoy Manna Dey, Kishor saab, Mukesh, Talat saab and other singers of today. But there is / was only one COMPLETE singer and that is Raffi saab. So in my mind, argument as to who is the best singer of all time is settled.